In 2015, we will resume publishing posts on ggurdjieff.com. I would like to share with you what has been happening backstage since we paused posting earlier this year, and how it will affect our future posting. 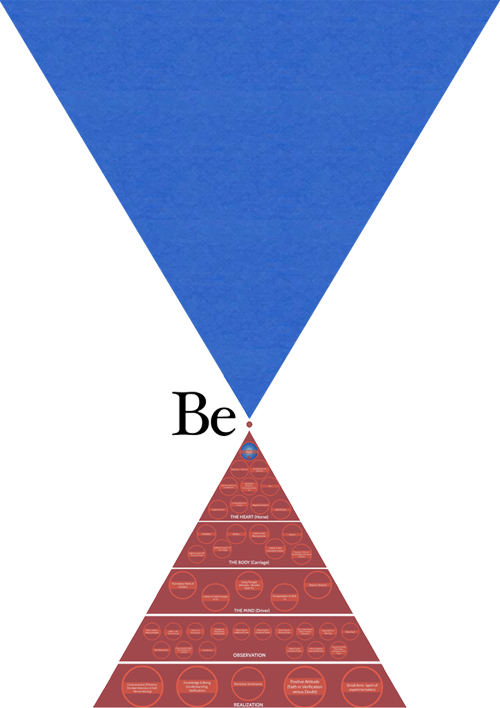 An obvious change is the redesign: we have chosen as our logo the command ‘Be’, with a period between two mirroring pyramids. To explain the inspiration behind this logo, we must envision what Gurdjieff underwent when he first presented the Fourth Way a century ago. “Machines,” “influences,” and “hydrogens” were Gurdjieff’s chosen terms, “planets,” “suns,” and “galaxies” were the canvas on which he painted an ancient psychological system. But why was he using modern scientific terms, when his schooling had occurred in the Biblical setting of Mount Athos, Turkestan, Tibet, Persia and Bokhara? Why was he not using Biblical terms? Years later, Peter Ouspensky would praise Gurdjieff’s presentation skills, remarking that his command of the spoken word exceeded even the best professors of his time. Such advanced skills would imply flexibility and adaptability. Clearly, Gurdjieff’s power of presentation lay not only in his command of esoteric knowledge, but also in his ability to keep his fingers on the pulse of his students and speak in a language comprehensible to them. A doctor learns the language of medicine, a lawyer the language of law, and an engineer the language of physics. When doctors discuss the cerebral cortex or the solar plexus, they know exactly which part of the body is meant, whether they are American, Russian or Chinese. Indeed, what medical disasters would ensue if there weren’t a worldwide consensus on the Latin terminology of the human body! And what about the human soul? In our age, spiritual terminology abounds. Terms such as “non-attachment,” “compassion,” and “mindfulness” are used freely, under the presumption that everyone knows exactly what is being said, from what point of view, and in what connection. But do we? Our experience on ggurdjieff.com has proven otherwise. The same term can mean anything to anyone. It has become evident that, to discuss man’s possible evolution, a more precise language is needed, just as Gurdjieff said it would be. This realization has given birth to a new direction, represented by our new logo. We encapsulate man’s evolution in the command Be. It towers above all the Fourth Way principles (struggling with imagination, identification, expression of negative emotions, etc.) and is lifted by them. Together, these topics form a pyramid, based on their relationship to each other. In other words, the pyramid arranges the system ideas with relativity. Some are central, while others are secondary. Some are only possible after others are mastered. The pyramid incorporates these nuances, showing us where to start, where to proceed, and what to aim for. The ultimate aim of the work is transformation, represented by the blue inverted pyramid above. This expansion into a higher state dwarfs the efforts made to attain it, which is why the blue pyramid dominates the red one. But every hair is counted, and it is the patient accumulation of our small efforts that ignites big states. The next posts on ggurdjieff.com will survey the architecture of this pyramid. We will take advantage of its scale and relativity to become more definite with our readers. In so doing, we will also be exploring what it might mean to adapt the Fourth Way to a 21st-century audience. After all, if Gurdjieff appeared in the West today, we have every reason to believe that he would adapt his presentation to our age, taking advantage of modern technology to convey his ancient teaching, using plasma screens instead of blackboards, interactive diagrams instead of wordy explanations, and video conferencing instead of camel expeditions to the Gobi Desert.